Should your business be on social media? YES. Should you create an account in every website out there? NO! 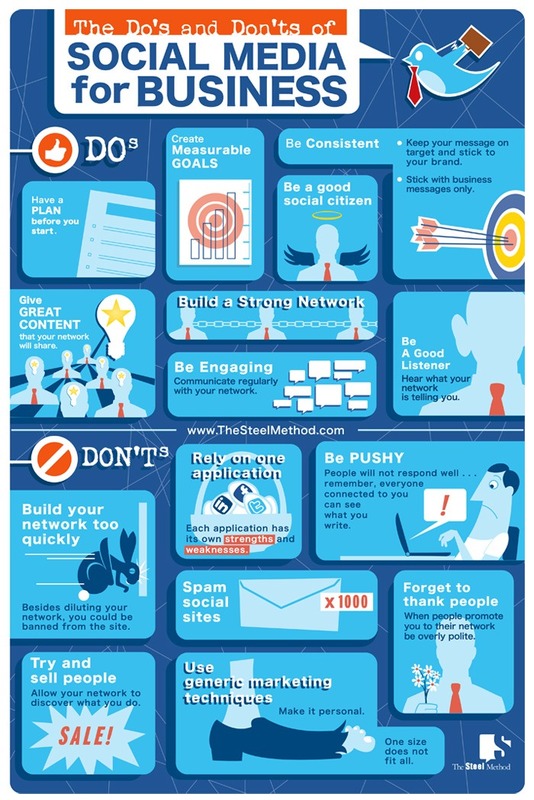 Even if you’re already active in Linkedin or any other social network, this infographic reunites the main Do’s and Dont’s of social media for business which will help you to build your social empire. Have a plan before you start and set measurable goals since the beginning. Your digital goals should always be aligned with your core business goals. Keep in mind that you cannot manage what you cannot measure. Work with your team towards building a content creation culture. If your business has a website, it is likely one of your digital goals would be increasing traffic and doing that via great content is a great chance to attract potential customers and leads. Social media is a good place for lead generation. Make sure you are interacting back and genuinely paying attention to what your network is talking about. Even though you are managing a business page, you are still talking to people. Financial gains should never be the your first social goal. Most businesses will take from 1,5 to 5 years to be able to identify financial gains via social, so focus on connecting with your audience and building awareness. Only consistent social efforts will lead to financial gains. And remember: the biggest mistake you can make is refusing to be online! Image courtesy of The Steel Method.